Seibu Railway class 6000 EMU. The train consists of 10 cars, of which 6 cars are motorized. 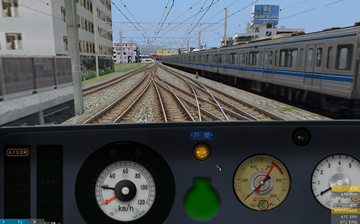 Realistic driver's stand with speedometer, manometer (pressure gauge), various indicator lamps and pilot lamp. 1430 pax. (of which 522 seated). Overhead wire 1 500 V DC. About the Seibu Railway class 6000 EMU at Wikipedia. The site for this train has disappeared from the Internet.